Another reason to travel to Kerala, and this time to Trivandrum too - a seminar. 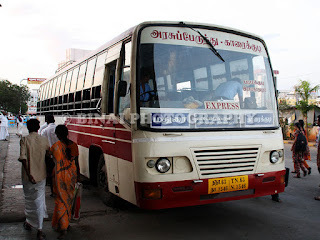 I did not look much when deciding on which bus for my return journey - I was particular that I wanted to travel via Nagercoil this time. The seminar would run late into the evening, and hence wanted to have some breathing time - the decision was simple, as I booked a seat on Kallada G4. 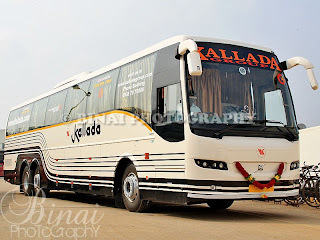 So it was Kallada G4. As expected, the seminar ran quite late, and I had to leave the seminar before it got over. A quick visit to Thampanoor and some bus spotting, I headed back to Jay's home. It rained on my way back, and Thampanoor was flooded. It was a messy auto ride to reach his place. Jay's mom had prepared delicious dinner for that night and his dad offered to drop me at my pick-up point. We left home around 1925hrs. It was a very short journey to the pick-up point. I reached there by 1945hrs. 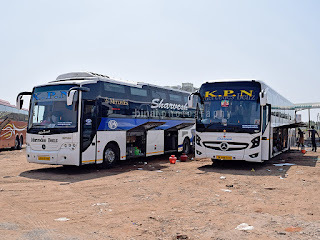 A couple of A1 Travels buses, the Suresh Kallada buses to Bangalore (both the B9R and the Mercedes Sleeper) and the Golden Travels B9R to Kannur were parked there. I bid adieu to Jay and his dad (thanks a lot for that hospitality), and began my wait for the bus. My bus rolled in at 2014hrs. Boarding commenced immediately. Although I had a printout, I decided to check out if the SMS would work - just showed my SMS - no questions asked, and no objections - my presence was marked on the chart. I got into the bus - we were having very good loads even on a Monday night! I settled on my seat - my co-passenger was already there. I hate sitting in the bus waiting for it to start - but had no choice today. We started off at 2037hrs - 7 minutes late. The driver was quite relaxed - no signs of hurry, and no honking as well. We had a pickup at Nemom (2052hrs). In the meantime, a fairly old Tamil movie was played on the AV System. I was already half asleep - the sound made things bad for me. We stopped at Neyyattinkara (2112hrs) for a pickup before crossing into Tamil Nadu. Our next pick-up was Marthandam (2141hrs) and then at Nagercoil (2219hrs) - all these points contributed not more than one passenger each! We were running a healthy load even for a working day. The stopped for sometime on the roadside inside Nagercoil town for some unknown reason. I dozed off for sometime on the way - did not really notice when we hit the highway. We stopped at fuel station at a place called Panagudi for a leak break (on request by some lady passengers). The break lasted about 5 minutes, and we started off at 2252hrs. I slept soon after we started off from break. A nice undisturbed sleep for most of the time. I woke up at around 0530, when we were on the Krishnagiri flyover. 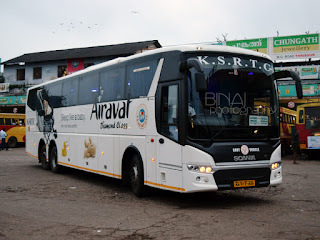 I was sure that we wouldn't reach Bangalore at the scheduled time - especially since we were on the Krishnagiri route instead of going via Rayakkottai. I slept for some more time, and woke up just as we passed Attibele. The bus stopped for drops at Chandapura (0644) and Electronic City (0653hrs). I was finally dropped at Silk Board at 0702hrs. 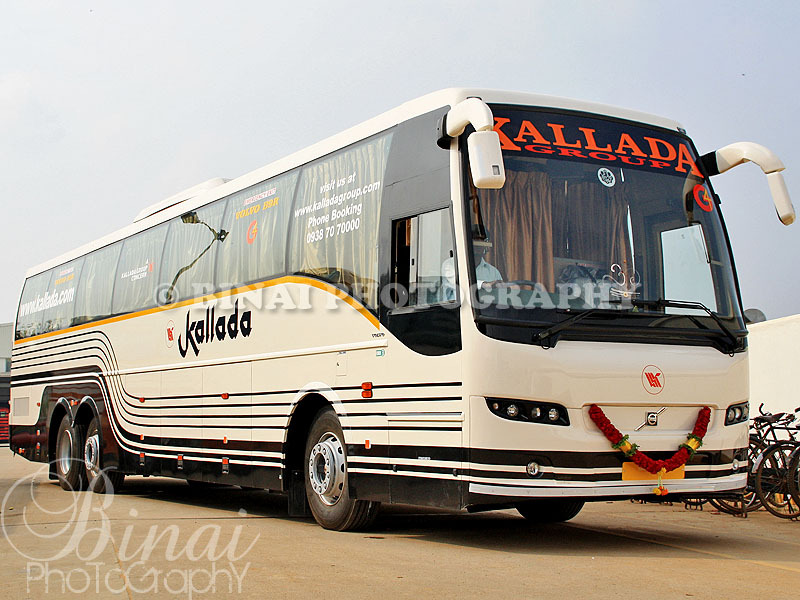 End Notes: The bus was KA-01-AB-7438 (the last B9R of Kallada G4), with about 1.7 lakh kms on the odo. The bus was in pristine condition - no squeaks (except those coming from baggage). The seats were a bit uncomfortable - I felt the recline angle was lesser compared to other buses. The crew were well behaved - and they were concerned about time. The end-to-end running time came to 10h25m - much faster than the buses that come via Ernakulam. No wonder a lot of passengers now choose this route - and we had very healthy loads for a working day as well! I liked the service on the whole. Will I take this service again? I am not a regular passenger on that route - but will surely prefer this service when needed. I'd recommend this as well. I took the G4 Kottarakara-B'lore green colored bus from Thiruvalla to Bangalore on June 30th. Even I had a feeling that the recline angle is a bit less on that bus, but then pushed aside the thought as just a feeling. But now that even you say you felt the same, maybe there's more than just a feeling.